Expand the capabilities of the already powerful EOS 7D Mark II, EOS 5DS and EOS 5DS R cameras to include Wi-Fi® capability with the optional Wi-Fi Adapter W-E1 accessory. The same size and shape as an SD card, the W-E1 fits easily into the SD card slot to enable wireless communications with compatible smartphones, tablets and computers through dedicated apps. It opens up a wide range of possibilities for remote operation, including adjustment of camera settings and focus, plus shutter release for comprehensive camera control up to 32.8 feet away. Photos can be reviewed and transferred easily to a computer or compatible smart device, as can MP4 video stored on the EOS 7D Mark II. Simple to install and use, the W-E1 helps to deliver the convenience and benefits of Wi-Fi® while significantly enhancing the creative potential of both you and your EOS 7D Mark II, EOS 5DS or EOS 5DS R camera. 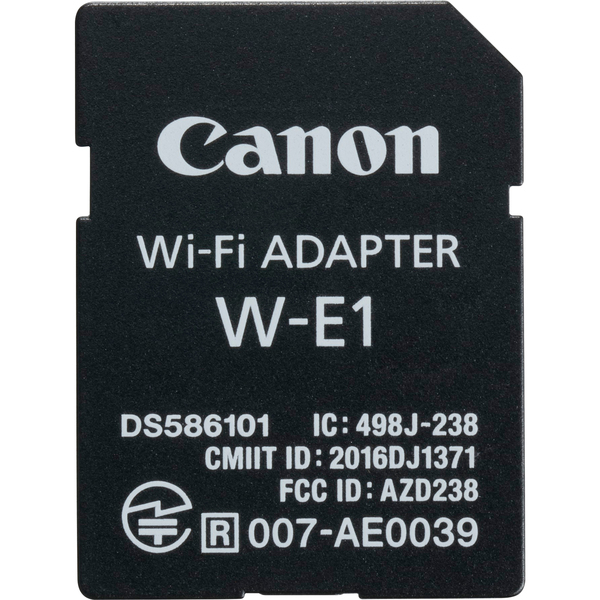 The Wi-Fi Adapter W-E1 is shaped like an SD card to easily insert in the SD card slot of the EOS 7D Mark II, EOS 5DS and EOS 5DS R cameras in order to provide Wi-Fi® capabilities. With the W-E1 installed in the SD card slot, a CompactFlash card must be installed into the camera's dedicated CF card slot in order to record and store images. The W-E1 is currently only compatible with the EOS 7D Mark II, EOS 5DS and EOS 5DS R cameras. Wi-Fi® capability provides easy transfer of images (and videos in MP4 format for the EOS 7D Mark II camera) to a compatible smartphone or tablet, and remote still photo shooting and camera still photo setting changes. When inserted into the SD card slot of the EOS 7D Mark II, EOS 5DS or EOS 5DS R camera, the Wi-Fi Adapter W-E1 provides the convenience and benefits of Wi-Fi® capability when paired with a compatible smartphone or tablet that has the Camera Connect mobile app installed. These Wi-Fi® functions include the ability to change camera settings on the fly, shoot still images remotely, as well as view and transfer images and MP4 videos. For fast and reliable communication, the W-E1 supports Wi-Fi® standards of 802.11b/g/n at 2.4GHz with a range of up to 32.8 feet. Povides Wi-FiWi-Fi® capability with a computer using EOS Utility and enables remote shooting of still photos and quick setting changes, as well as easy transfer of images and videos. Ideal for working in the studio or on location, the W-E1 helps wirelessly enable SLR operation directly from a computer using Canon's EOS Utility software. It facilitates camera operations such as AF and setting changes as well as shutter release for still photographs, and also enables transfer of still photographs and MP4 movies stored on the camera's CF card.